On Monday, the Kisatchie Fly Fishers hold their monthly general meeting at the Rapides Westside Library in Alexandria. Time is 6:30pm. Guest speaker will be Dr. Leesia Marshall of LSUA's biology department, who will present on the River Continuum Concept. The meeting is open to the public. For more info, go to www.kisatchiefly.org. Also on Monday, the Red Stick Fly Fishers hold their monthly fly tying session at the Bass Pro Shops in Denham Springs. Time is 7:00pm. Bring your tools, if none, the club has a few sets for use during the session. Materials are provided. For more info, go to www.rsff.org. This day means many things to many different people. For most, it's a day of feasting with friends and family. 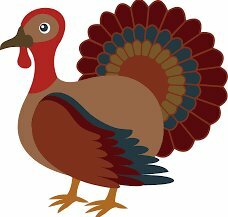 Here in Louisiana, the dinner table will be adorned with turkey, roast, venison, duck or other hearty meat slowly cooked, along with Cajun favorites like sweet potatoes and corn machcoux. There's a good chance that the bird of choice is stuffed with crawfish or shrimp. I'm getting hungry just typing this, lol! Here in the Cormier household, while we do enjoy our feasting and football, we still recognize Thanksgiving as a day to give thanks for all the blessings the Lord has bestowed upon us. We're thankful for all the woods, waters and wildlife we have here in the Sportsmans Paradise. And for the numerous friends we've made through our love of outdoors. 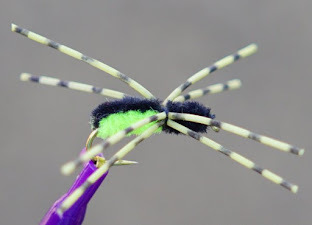 On Monday, the Kisatchie Fly Fishers hold their monthly fly tying session at the Rapides Westside Library in Alexandria. Time is 6:30pm. 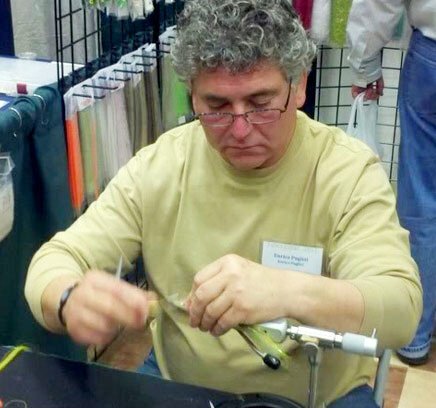 Bill Morrison will lead in tying the Dragon Tail Streamer. Bring your tools, if none, the club has a few sets for use during the session. Materials are provided. Beginners are welcome. For more info, go to www.kisatchiefly.org. On Tuesday, the Contraband Fly Casters hold their monthly meeting at St. Paul Lutheran Church on 1620 East Prien Lake Road in Lake Charles. Fly tying and discussion at 6:00pm, meeting at 7:00pm. On the agenda: the club's upcoming fly fishing expo in July. Guests are welcome. For more info, go to www.contrabandflycasters.net. Also on Tuesday, the Lafayette Kayak Fishing Club holds their monthly meeting at Pack and Paddle on 601 East Pinhook in Lafayette. Time is 6:00pm. On the agenda: recap of the Turkey Trout Throwdown, CPR Update, tackle tips, and fishing reports. For more info, go to www.lafayettekayakfishing.com. Earlier this month, it was reported by outdoors contributor Joe Macaluso in The Advocate newspaper (Baton Rouge) that the Louisiana Outdoors Writers Assocation (LOWA) has added the Rio Grande Cichlid to the state's freshwater fish records list. Rios are native to south Texas and northern Mexico. Due to the aquarium trade - and intentional or accidental releases into waterways - they've become established in Orleans and Jefferson parishes, and southern Florida. Incapable of tolerating very cold water, Rios are most active from late Spring thru early Fall, and seemingly disappear in Winter. They've become a favorite of warmwater fly anglers due to their tendency to eat flies, their wary nature and dogged fight when hooked. Their popularity among flyfishers led to the New Orleans Fly Fishers club establishing the annual "Rio Grande Rodeo". The 10th annual rodeo was held in early October. So far, flyfishers have been elated with the news. 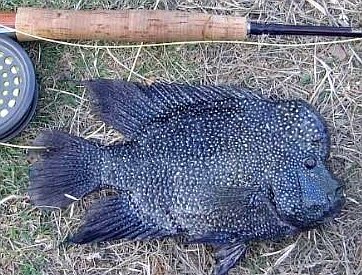 According to LOWA Fish Records Chairman Lyle Johnson, the state's only cichlid will now list the top 10 of this species effective immediately. 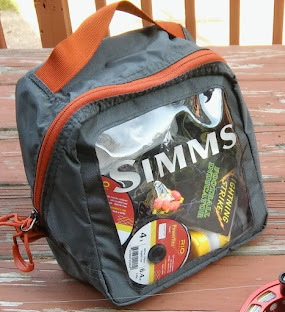 This will apply to both "Rod and Reel" and "Fly Fishing" divisions. Records can be submitted via forms on the laoutdoorwriters.com website. On Monday, the Red Stick Fly Fishers hold their monthly general meeting at the Wildlife and Fisheries building on Quail Drive in Baton Rouge. Time is 7:00pm. Guest speaker will be David Cresson, Executive Director for CCA-Louisiana. David will talk on the latest on saltwater fisheries management and conservation projects the organization is working on. The public is welcome. For more info, go to www.rsff.org. On Tuesday, the North Louisiana Fly Fishers hold their monthly meeting at the Red River National Wildlife Refuge in Bossier City. Gathering starts at 6:00pm, meeting at 6:45pm, program at 7:00pm. Rush Clay will do a presentation on Lake Tenkiller in Oklahoma. Also, election of 2019 NLFF board. Guests are welcome. For more info, go to www.northlaflyfishers.org. On Thursday, the New Orleans Fly Fishers will hold the second of their twice-monthly fly tying sessions at St. Francis Xavier community building on 444 Metairie Road. Time is 7:00pm. Joe Bandera will be teaching the A.P. Emerger. Bring $1 to cover materials. Bring your tools, if none, the club has sets for use during the session. Beginners welcome! For more info, go to www.neworleansflyfishers.com. On Sunday, Pack and Paddle will welcome the "Sage, Redington and Rio Factory Tour" in conjunction with their quarterly "Fly Fishing Hangout". Time is 2:00pm to 4:30pm. Location is the PnP store on 601 East Pinhook in Lafayette. Representatives from all three companies will be on hand with rods, reels and lines for attendees to test cast. Also, there'll be fly tying demonstrations and locally-brewed craft beer. In addition there'll be a raffle for a Redington rod, special discounts on Sage, Redington and Rio products, and more. For details, go to www.packpaddle.com. On Saturday, December 8th, Fishing Tackle Unlimited in Houston will host their 11th annual Inshore Expo at their store on 8723 Katy Freeway. Time is 10:00am to 5:00pm. The FTU Expo is a free event dedicated to light tackle and fly fishing interests. 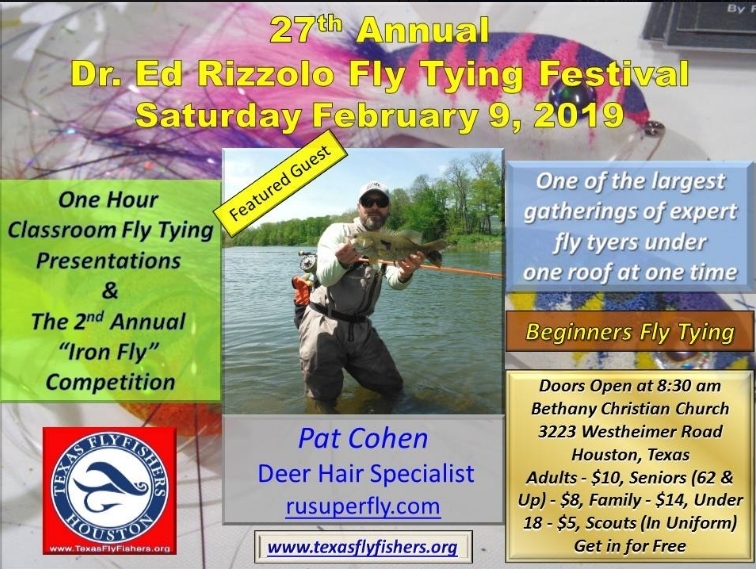 In addition to seminars by national and regional anglers and captains, there's also fly tying demos by area tiers, casting demos, and factory representatives. Each year, the FTU Expo features a renowned name in fly fishing. Past headliners include Enrico Puglisi, Flip Pallot, Steve Rajeff, Andy Mill, Gary Loomis - to name a few. This year's headliner will be Enrico Puglisi. 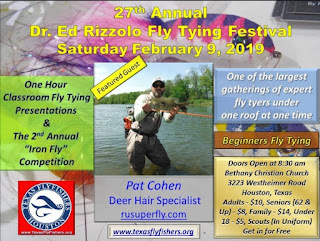 If you missed his appearance at FTU several years ago - or at Uptown Angler in New Orleans a few years back - then this is a great opportunity to see one of the most innovative, entertaining and informative fly tiers alive today. Other presenters include Laguna Madre guide Ernest Cisneros, Aransas fly fishing guide JT Van Zant, and outdoors artist Chance Yarbrough. For more info, go to www.fishingtackleunlimited.com. Tuesday is Election Day. Please remember to go vote! Also on Tuesday, the Acadiana Fly Rodders will hold their monthly meeting at Grace Presbyterian Church Hall. Time is 6:30pm. Guests welcome. For more info, contact Bob Tabbert at 337-989-0815. On Wednesday, the Pontchartrain Basin Fly Fishers will hold their monthly meeting at the Abita Brew Pub on 72011 Holly Street in Abita Springs. Time is 6:30pm. 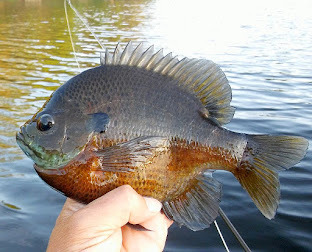 For more info, go to www.pbasinflyfishers.blogspot.com. On Thursday, the New Orleans Fly Fishers hold the first of their twice-monthly fly tying sessions at St Francis Xavier Church Hall, 444 Metairie Road. Time is 7:00pm. Bring your tying tools, if none, the club has sets for use during these sessions. Materials provided - bring $1 to cover costs of materials. For more info, go to www.neworleansflyfishers.com. This weekend, the Red Stick Fly Fishers will hold their annual "Fall Catch and Eat" marsh fishing outing along Highway 1 south of Galliano. The Saturday night fish and shrimp fry is open to members and their guests, and members of other clubs. RSVP required. For details, go to www.rsff.org.